Chloe Gambin during the high jump event at Marsa. 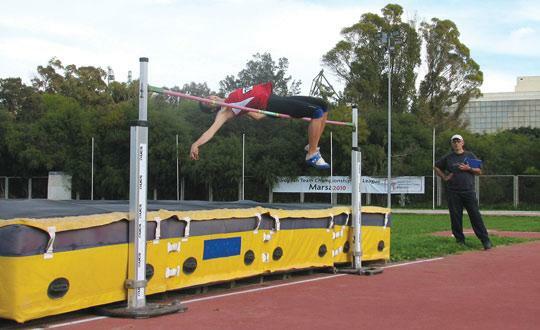 Female track and field athletes seemed intent on stealing the show at Marsa on Saturday, with a number of eye-catching performances produced despite the windy conditions that threatened to wreak havoc with the Athletics Malta meeting. Chloe Gambin cleared 1.61m in the women’s high jump, breaking the junior and open records in the process. Diane Borg made the MQS (minimum qualifying standard) for the European Indoor Championships with a wind-legal 7.71s in the 60m sprint. For her part, Rebecca Camilleri is looking more and more comfortable, managing over six metres in the long jump. She produced a wind-assisted 6.16m leap. In the men’s 60m, a resurgent Karl Farrugia came out on top in all three meetings comprising this pre-season programme with a 7.06s run, confirming his impressive recent form. In fact, the Allcomers Aloysians sprinter secured his second consecutive victory in the event’s final last Saturday, again bouncing back from second place in the heats. After the down-to-the-wire duel with Andy Grech, where both clocked identical times and had to be separated by finish-line technology, Farrugia is compiling some great early-season experience – something that should pay dividends as the season progresses. Young Christian Luke Chetcuti outpaced all opposition in the 3,000m race (9m34.85s) and Matthew Croker produced a strong run over 300m, winning it in 36.53s. Away from the track, Rachid Chouhal did not need to break into the seven-metre mark to come out on top in the long jump as his main rival, Grech, did not manage a valid jump. Kevin Galea took centre-stage in the javelin throw, covering a distance of 39.58m. With the much-awaited Malta Marathon on this weekend, track and field returns to the spotlight with the first Aggregate Meeting of the year on March 12.